To show you exactly how elimination communication works, I recommend you start by watching the video below. Here, Andrea explains what elimination communication is, how to know when a baby needs to pee, why a parent might choose EC, how to get support, how to start a practice if you wish, and what might get in your way…. Learn how to dip into all 4 and within a month or two EC will become second nature. Focus on only one or two of these and in later months things might backfire. It is best to familiarize yourself with all four and set a solid foundation! Point is, if you choose to do EC, you will *absolutely* reduce the number of diapers you use, and thus positively impact your baby’s well-being and the saving of our sacred environment. And do we need to mention that this means less poop-scraping for you? Pretty cool. It’s important to note that having a “diaper-free” baby actually means having a baby who is “free from an exclusive dependence upon diapers.” It doesn’t mean having a naked feral baby peeing all over your floor (although if you really want to do this, who am I to stop you?) 🙂 Anyway, a baby who is potty trained while naked is not a potty trained baby. We wear clothing in the Western world. Carrying on….naked or modified diaper-free time is, indeed, *essential* during the observation periods at the beginning of your EC practice, and from there on out, diaper-free time can be good for your baby. Many do it 30 minutes a day, before the bath. But as with everything in EC, you’ll want to strike a balance and beware of overdoing naked diaper-free time. Be sure you know what you are teaching/conditioning your child to do. Teaching a babe to pee on the floor is just as bad as teaching her to pee in a diaper, in our opinion. 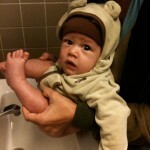 Go Diaper Free can help you avoid both of these situations! Check out my book, Go Diaper Free…the easiest way to get started with Elimination Communication the right way. No matter how you do it, the key is to be consistent, committed, and have the right attitude. There are ways to do EC with your baby that don’t confuse her and that help you maintain your usual family lifestyle. Anyone can do it. 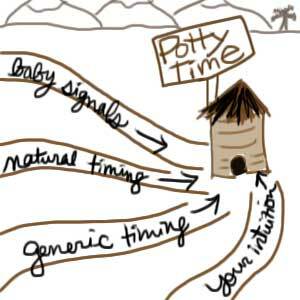 Although EC is about communication, not completion, you can generally expect a certain level of day/night dryness and potty reliability (ie: done with diapers) by 6-20 months, depending on when you start and how often you practice.